Wow! It has been a crazy few weeks. 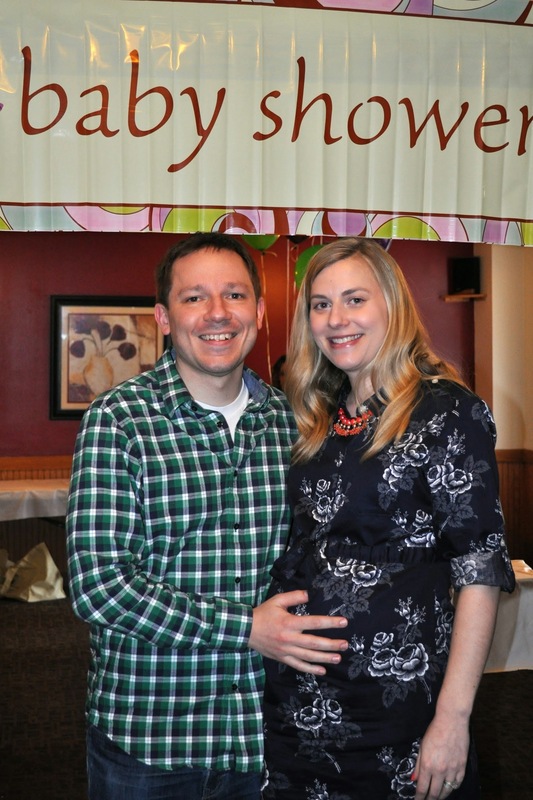 Last weekend we were in Pittsburgh and had a baby shower for the little man. I am just overwhelmed with how many family and friends came to celebrate with us. 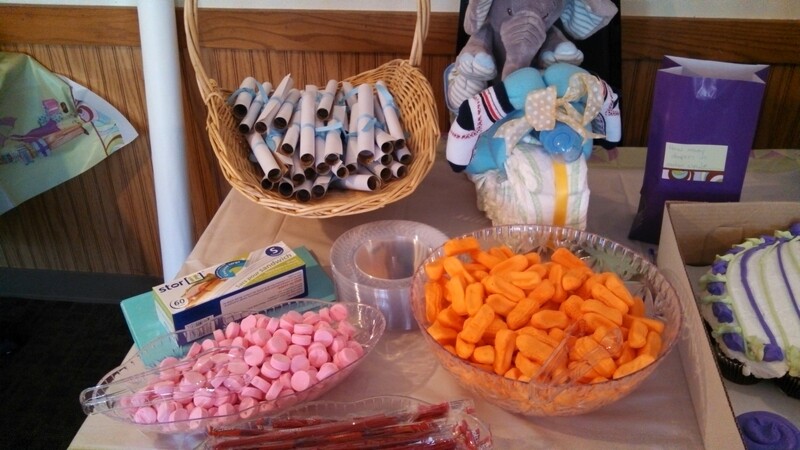 My family did such a good job getting everything together and decorating for the shower. At the shower they made up 15 different prize baskets for games along with favors for everyone. They even had personalized M&M’s made up for the tables. They really did a great job! I’ve posted some pictures below from the shower. 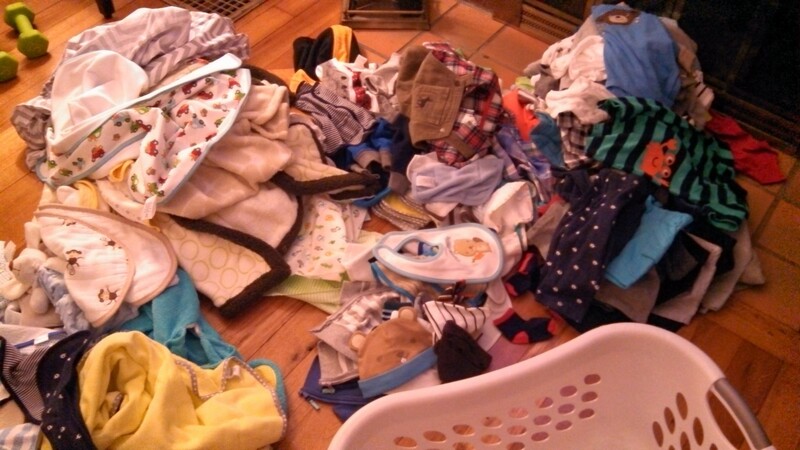 As I write this blog post I am waiting for the first load of baby clothes to come out of the dryer. I couldn’t wait any longer! I just had to buy some Dreft on the way home from work and start cleaning some clothes. It’s funny, a few weeks ago I was worried that the baby would have to go naked. Little did I know my friends and family would load me up with a bunch of stylish adorable clothes. Once everything is washed I need to think of the best way to organize them. I will probably organize by size, and put most of the onesies and sleepers in the changing table drawers, and put the summer outfits in the other set of drawers. Then I guess I will hang the outfits that came together with little jackets. I don’t know. I am feeling a bit overwhelmed now. 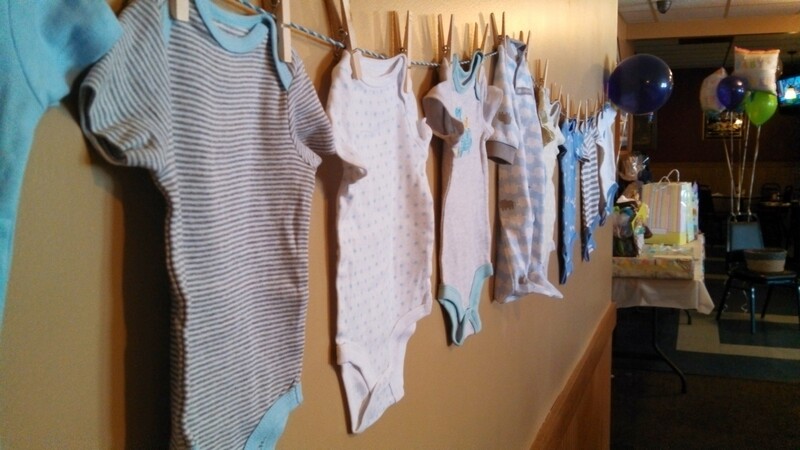 How did all of you new moms organize the clothes? 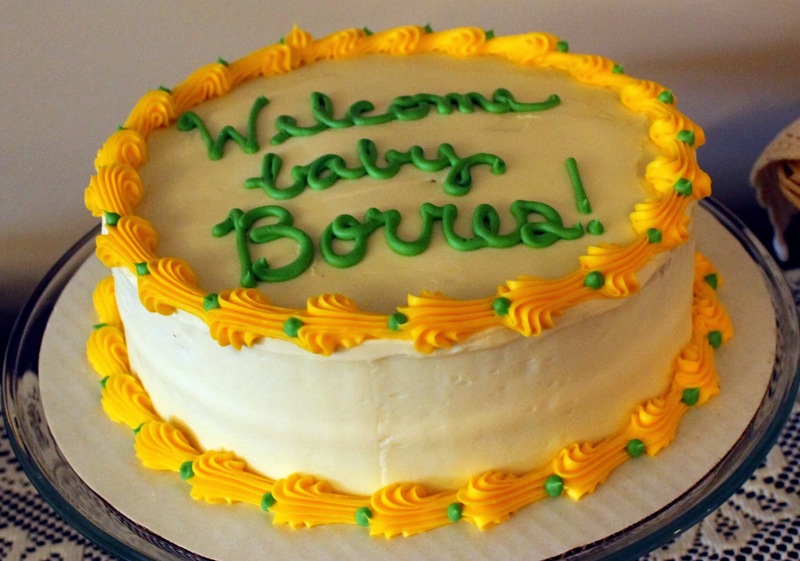 Not really knowing where to start with all the things we need to do before baby comes. 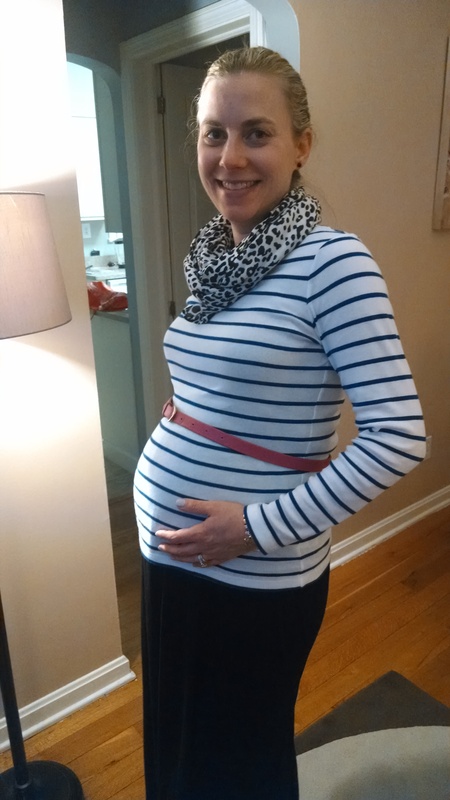 We had another doctor visit yesterday, and baby is doing fine at 36 weeks. Heartbeat is good, as well as positioning. I hope that he has made himself comfortable, and he doesn’t decide to make a move. 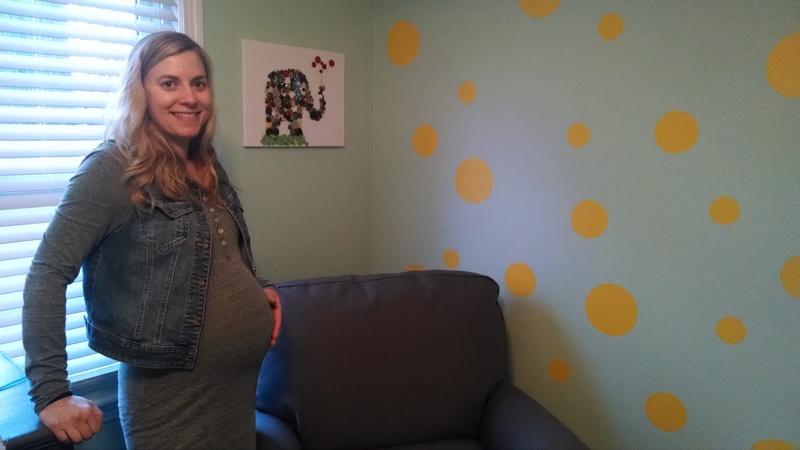 The one thing that surprised me from the appointment is that the doctor said that he could come any time, but that we should be prepared to go to 41 weeks. I think if he does decide to wait awhile I will stop working at 40 weeks. All this not knowing is really hard for me. I just hope that he is healthy when he does decide to make his appearance. Well time to get the laundry out of the dryer, and start another load. If you are wondering, yes, I have put together my part of the hospital bag. Once the laundry is done I will add the baby’s things. I will post what I have included if I have time this weekend. 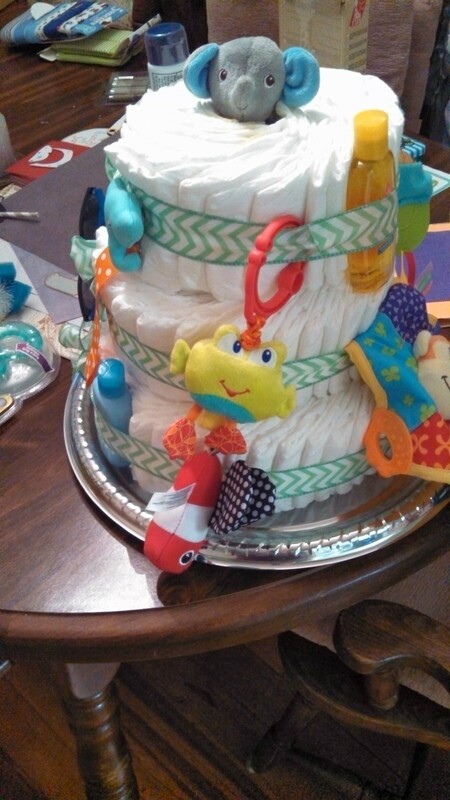 One of my diaper cakes. Thanks Lisa. 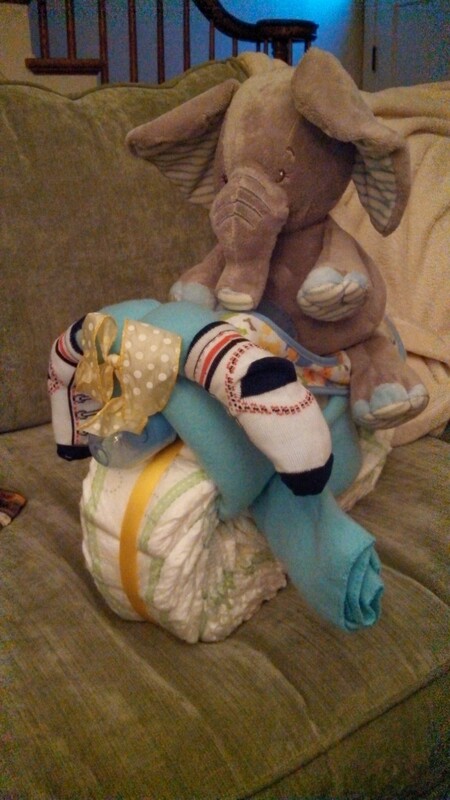 Motorcycle diaper cake made by Kim. Adorable onesies. Thanks again, Lisa. 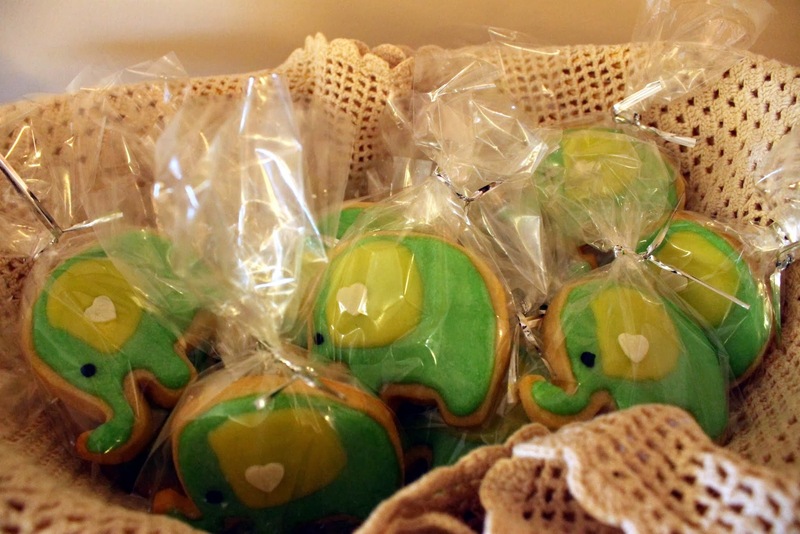 They got some of my favorite candies for the shower. Thanks for all of the clothes! Now it’s time to do some laundry. At 35 weeks today and am feeling a lot of movement from the little man. You can tell he is running out of room because with every move he makes I see my stomach change shape. He also still gets hiccups a few times week. 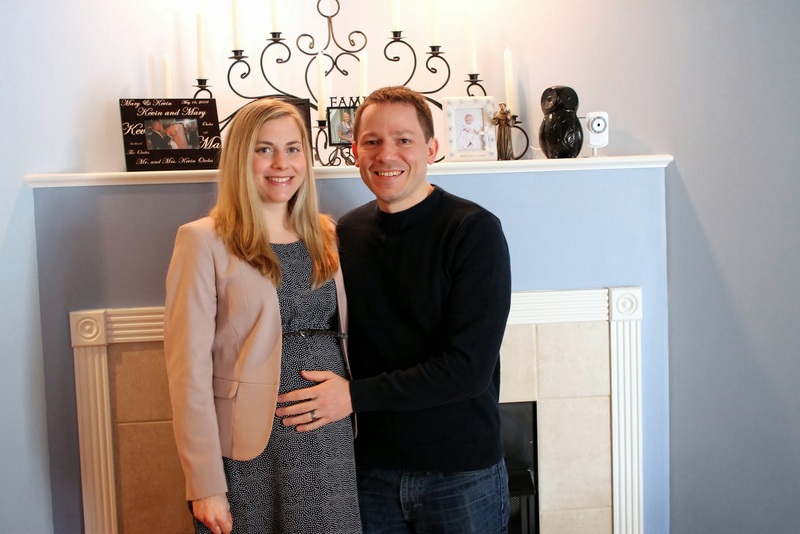 At the doctors this week she said that he is growing at a normal pace, and his head is down and low. That’s a good position, but it makes me need to go to the bathroom more often. Regardless of the constant bathroom breaks, let’s hope he stays this way to make for an easier birth! 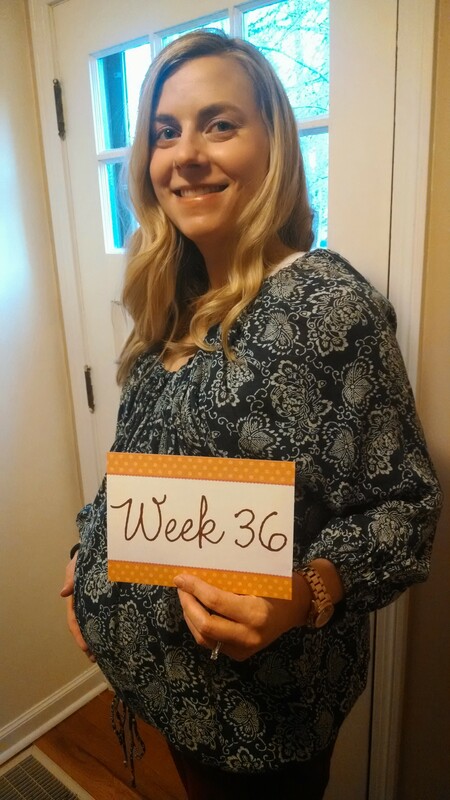 This week I have been experiencing some Braxton Hicks contractions. They haven’t been uncomfortable – just odd. The doctor assured me that this is normal even when my stomach looks indented in the middle. She says this happens because the muscles in my stomach are separated. It’s just my body getting ready for the real thing. This week I have done some shopping in an effort to complete my hospital bag. I think I am in pretty good shape. I just need to wait until after the shower to pack for the baby. After the shower I will also wash all of the baby clothes and blankets. So he will be all set. As for Tony, I think he really only needs some clothes, snacks, tablet/kindle and toiletries. Once I have my bag complete I will make the list and take some pictures in case anyone is interested. It has become increasingly hard to find something that fits over my bump. 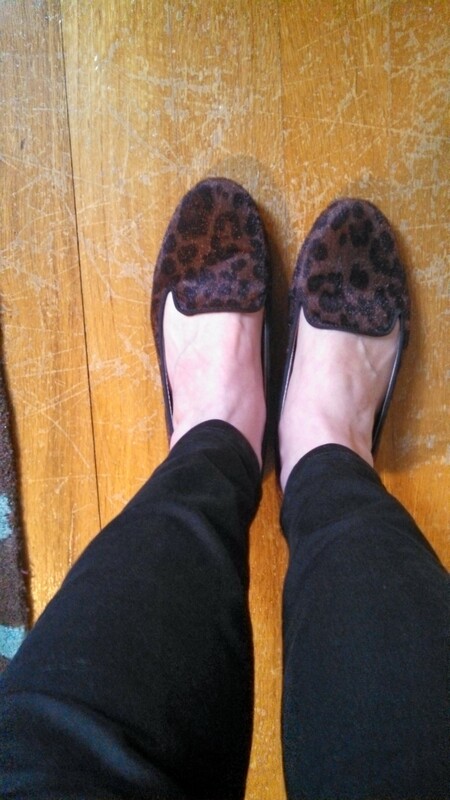 I think I might have 2 pairs of pants that fit right now (other than leggings). It will be nice to have more choices again down the road. 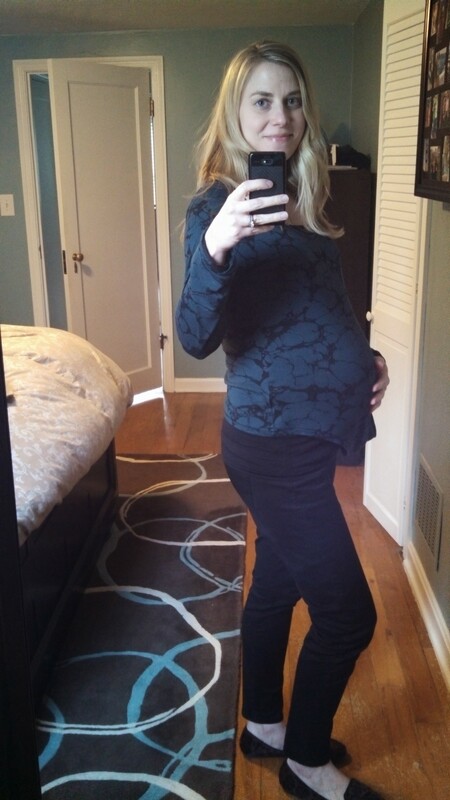 My belly has really grown in the last few weeks, and it has been increasingly hard to find a good sleep position. The problem is that there are only really two options: left side or right side. Every time I get comfortable on one side I have to wake up to pee, which is a task in itself. Other nights I get shin or calf cramps that immediately wake me up. The only way that I can seem to get rid of them is to get up, walk around, and try to stretch it out. However, I hear of all of this is just preparing me for the sleepless nights that lie ahead. Another funny thing about my growing stomach is that every time I eat something (which is quite often) the crumbs always stick to my shirt but it does make for a nice arm rest. So far we have completed 3 baby preparation classes, and we are officially pre-registered for the labor and delivery at the hospital. The only one that we still need to take is an infant CPR class next month – something that we want to know how to do, but hope that we never have to use. After all of these classes we are supposed to feel more prepared, but I am still not sure. Then again, I don’t think anyone is really “ready” to have a baby. I haven’t gotten to that nervous stage yet, but I am thinking in a few weeks as we get closer I might change my tune. My goal this week is to get the hospital bag all packed and ready for our trip to Pittsburgh for the shower. My husband thinks that I am crazy to want to have it packed so early, but I will just feel better if I do. Then I can have it in the car in case I do go into labor while at work. Not a fun thought, but who knows when he will want to make his debut. We have done a few more things in the nursery these past few weeks. 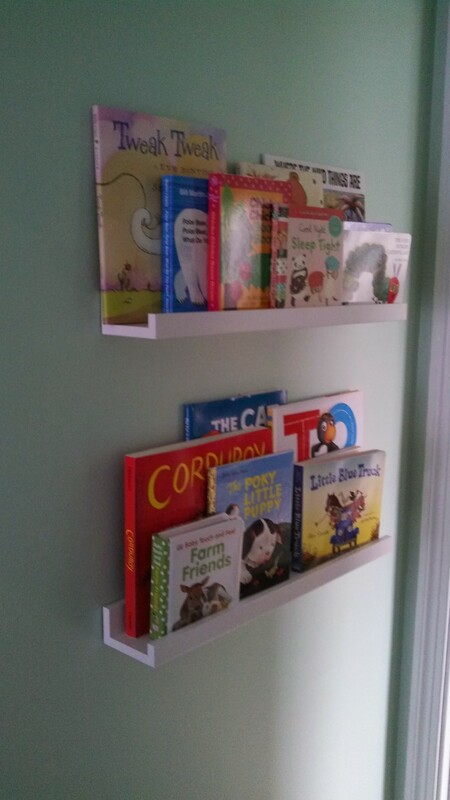 That included hanging the elephant button picture and adding 2 shelves to store books. I also bought some prints on Etsy to add to the picture wall that I would like to have on the currently empty wall in the nursery. The prints should arrive in the next few weeks, and then they will be ready for Tony to hang (thanks honey :)). Other than that I think I just need to start washing clothes, taking toys/gifts out of boxes, and finding a place for everything. I’m unable to zipper my winter coat. Shaving and putting on pants are very challenging. My new belly is making walking down the stairs quite a risky endeavor. People look at me funny at the gym. To get anywhere on time I have to start getting ready at least 10 minutes earlier than usual (though I suppose this will get even worse after he arrives). It is normal for my stomach to shift from one side to another. Also, I’ve recently begun to feel the little man’s hiccups, which is pretty neat. I am sure there are more fun things to happen in the next few weeks. What a great weekend it’s been. 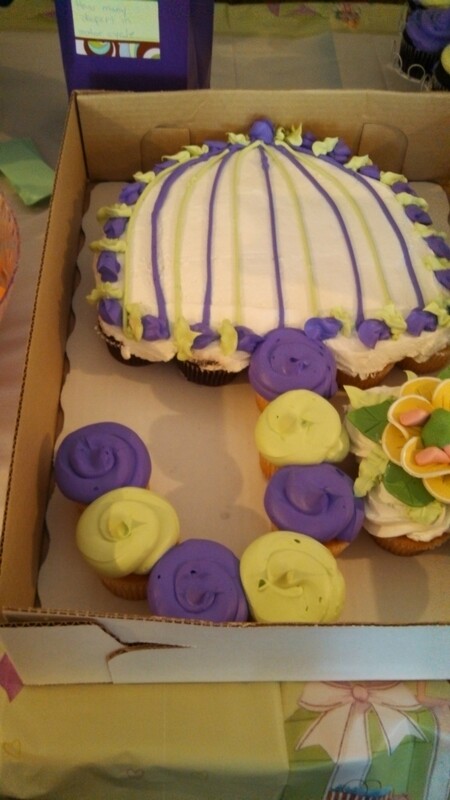 I was able to get some pampering done, and had a wonderful baby shower thrown by friends. 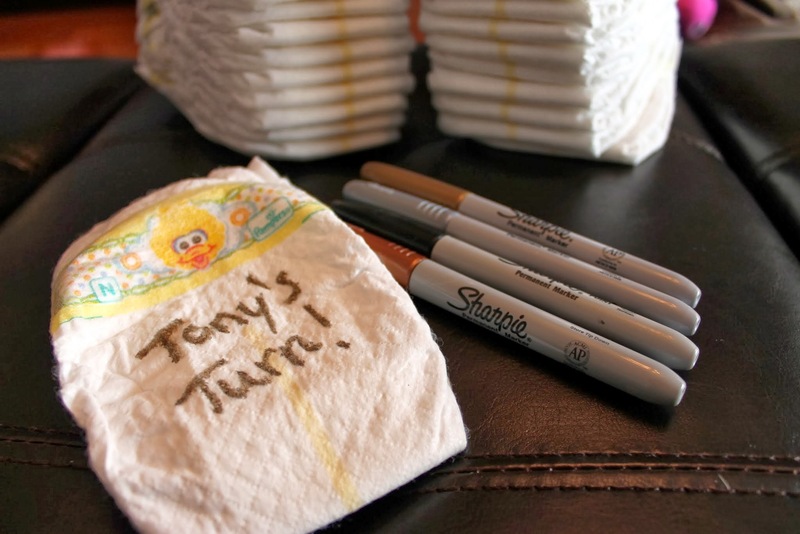 At the baby shower today everyone wrote something fun on diapers for us to read during late night changings. Such a cute idea that I am sure will put a smile on our face when we are exhausted and just want to go to sleep. We also cut out numbers for the monthly baby pictures to post for everyone to see how the baby is growing. 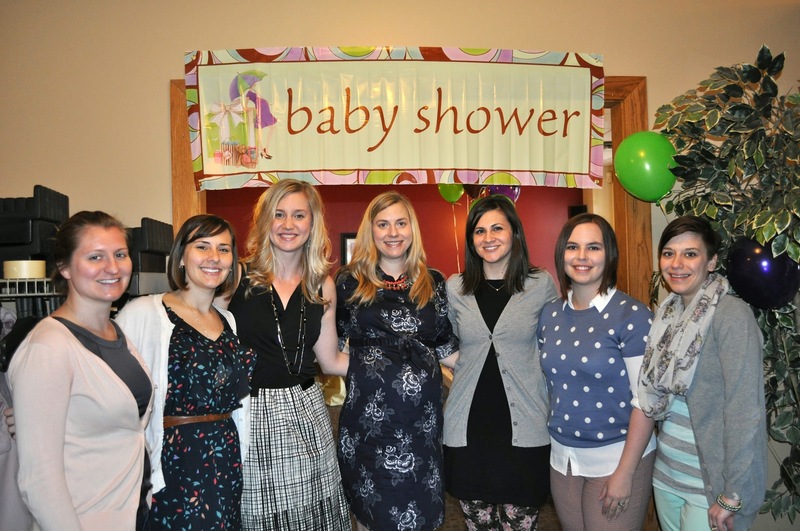 Thanks, ladies, for putting together a great shower!